You’ve probably heard of plain text and rich text but do you know the difference and the effects of each one? In ResRequest, many modules use plain text to sort and store information and so making sure your information is in plain text is important. What does it mean when we say rich text? Documents created in applications such as Microsoft Word and Google Docs automatically add extra features such as fonts, spacing and capitalisation. This formatting adds code, or special characters, to the text and creates what is termed rich text because it has this extra, hidden formatting. How does this affect you in ResRequest? Have you ever had a problem where your rooming calendar locked down, rates were displaying incorrectly on an external connection or even where a guest contact name was randomly showing on the description of an extra? 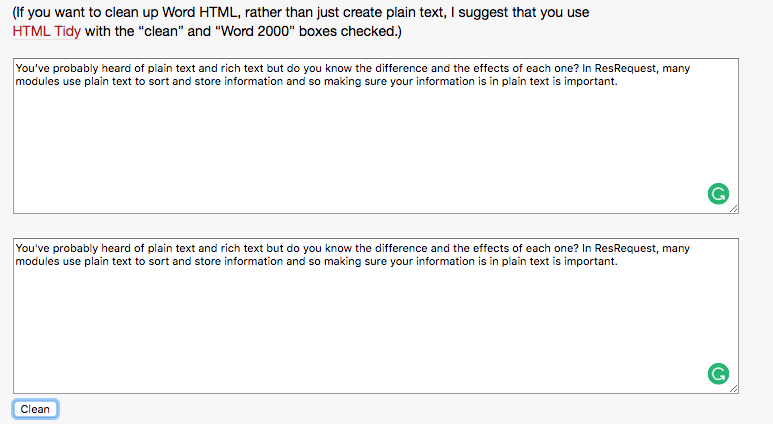 These are all examples of the effect of using rich text with special characters in the ResRequest system. What can you do to avoid special character issues? This is frustrating for you as a client and causes delays as we resolve the problem. Fortunately, there is a solution for which we can thank Jonathan Hedley at Amazon (thanks Jono!). Jonathon created a web-based tool which converts text to plain text very easily! 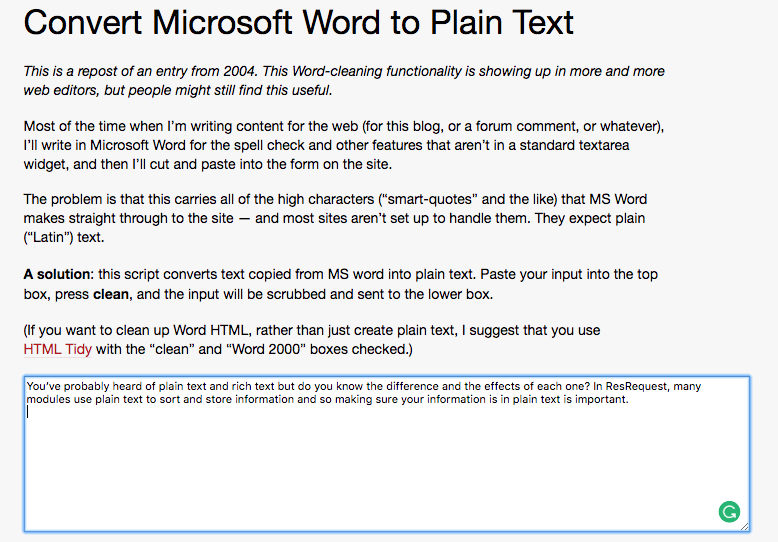 Below are the easy steps to follow to convert any text to plain text. You can then use this plain text in the ResRequest system without any hassles! Copy the rich text and paste it into the first window. Copy the ‘clean’, plain text from the bottom window and paste it into the relevant ResRequest field. If there has been a loss of spacing or capital letters, you can edit it accordingly. The most important area in ResRequest where you need to use plain text is your ResNova plugin. Copying text directly to ResNova from Microsoft Word or Google Docs will cause broken links and disrupt the functionality of ResNova. Populating your ResNova plugin popups with clean text can be done easily on the ResRequest business structure. Watch a tutorial on how to do this – bearing in mind what you now know about cleaning rich text! The conversion to plain text is vitally important and we hope that this blog will assist you in converting your text, preventing errors and ensuring smooth ResRequest functionality.